"Test System" Multimeter Supports Limit Testing, Averaging, Math and Vector Operations Measures AC and DC Voltages and Currents, 2/4 Wire Ohms, Frequency and DC/DC Ratios Supports Scanner via VXI Backplane Up to 65 Range Changes Per Second and 30 Function Changes Per Second Up to 6 Readings/s at 6.5 Digits, 1000 Readings/s at 4.5 DigitsThe Racal Instruments Model 4152A, 6.5 digit Digital Multimeter (DMM), combines DC and AC current and voltage measurements as well as 2/4 wire Ohms, frequency and DC ratio measurements into a one slot, C-sized VXIbus-based instrument. 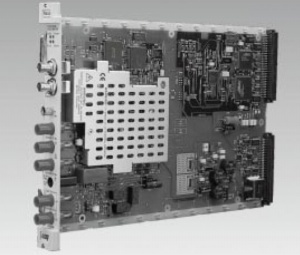 The 4152A includes instrument driver support for standard environments like LabWindows/CVI and LabVIEW. By fine-tuning the measurement speed of the 4152A s continuously integrating, multi-slope A/D converter, a balance between the need for fast throughput and measurement accuracy can be reached. For example, at 6.5 digits, the 4152A can take up to 6 readings per second with up to 0.0019% accuracy, or, at 4.5 digits, the 4152A can take up to 1000 readings per second with up to 0.012% accuracy. Since real-world test systems sometimes require range and function changes within a test cycle, the 4152A can change ranges within a function at a rate of up to 65 per second and can change measurement functions at the rate of up to 30 per second.